Kimber’s Micro .380 ACP pistols were not new for 2014 but they were available for testing at SHOT Show Media day 2014. The Micro includes many proven 1911 design elements that make them comfortable to carry, quick and safe to operate, and easy to shoot accurately. Weighing just 13.4 ounces and with a barrel length of only 2.75 inches, they are ideal for concealed carry. 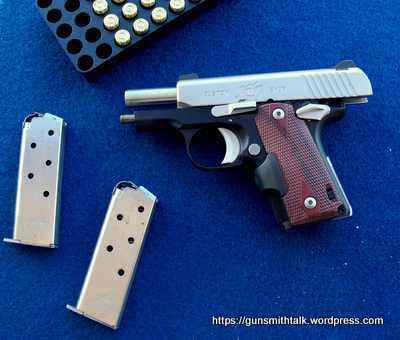 Like most 380 pistols, the recoil was light and easy to handle. Sights were easy to pick up accuracy was good for a small pistol. If you have big hands this gun is probably not for you, I have average size hands and it was easy to control and manipulate for me. Weighing less than 14 ounces empty. Slides on the Stainless and CDP models as well as all Micro barrels are machined from stainless steel for resistance to moisture and corrosion. All Micro frames are carved from aluminum. In many ways the Micro is a miniature 1911, among the most important Micro design features is a single action trigger with a short, smooth pull that delivers accuracy and instills confidence. The thumb safety, slide release and magazine release are pure 1911. Standard features include a lowered and flared ejection port for flawless ejection and a beveled magazine well for fast, positive loading. These are items that many shooters pay a lot of money to have added to a gun. Sights are steel mounted in machined dovetails for durability. Each Micro includes a flush-fitting 6-round magazine and an extended 7-round magazine is available as an accessory.